The date of the party is settled, and you’ve sent the invitations. Now, what about food and drinks? 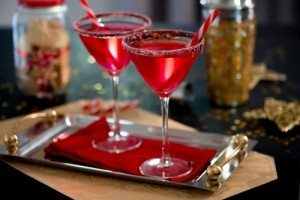 We have found some great recipes that you can make at home, just like the holiday cocktails we make in our restaurants. If you are not in the mood to make them at home, stop into any of our locations and we will shake one up for you! This sparkling punch is light and refreshing with a hint of whiskey. It’s made from Champagne, Creole Shrubb, Rich Simple Syrup and genever. Pineapple slices and star anise pods are used for garnish. It’s bright and festive—perfect for the holidays. This drink almost looks good enough to eat! It’s made from strawberry vodka, white crème de menthe, and cranberry juice. The candy cane is crushed and used for garnish. It’s a sweet and fun treat for any holiday gathering. You might associate pumpkin with Halloween and Thanksgiving, but it’s also a tasty way to punch up your traditional egg nog recipe. This pumpkin nog recipe is the perfect blend of pumpkin, cinnamon and rum. The drink is a mixture of ground cinnamon, pumpkin puree, vanilla extract, cane rum, eggs, sugar and whole milk. If you love the tastes of chocolate and red wine, you won’t be able to resist this drink. Made with finely chopped bittersweet chocolate, fruity red wine, milk, and a pinch of Kosher salt, it’s perfect for a party that falls on an especially cold or snowy day.